Infections due to the sexually transmitted bacterium Chlamydia trachomatis often remain unnoticed. The pathogen is not only a common cause of female infertility; it is also suspected of increasing the risk of abdominal cancer. A research team at the Max Planck Institute for Infection Biology in Berlin has now observed the breakdown of an important endogenous protective factor in the course of chlamydial infection. By activating the destruction of p53 protein, the bacterium blocks a key protective mechanism of infected cells, the initiation of programmed cell death. This protective function of p53 is also impaired in many forms of cancer. The new insights underpin the suspected relationship between chlamydial infection and the occurrence of certain types of cancers. Hundreds of mutations occur every day in almost every cell in our body. The protein p53 is then activated in order to limit these changes in the genome: either the cell repairs the damaged DNA or, if that is not possible, it triggers the cellular suicide program. In this way, cells are normally protected against the development of cancer. As the Berlin-based team at the Max Planck Institute for Infection Biology reported last year, chlamydial infections lead to a drastic increase in the mutation rate. 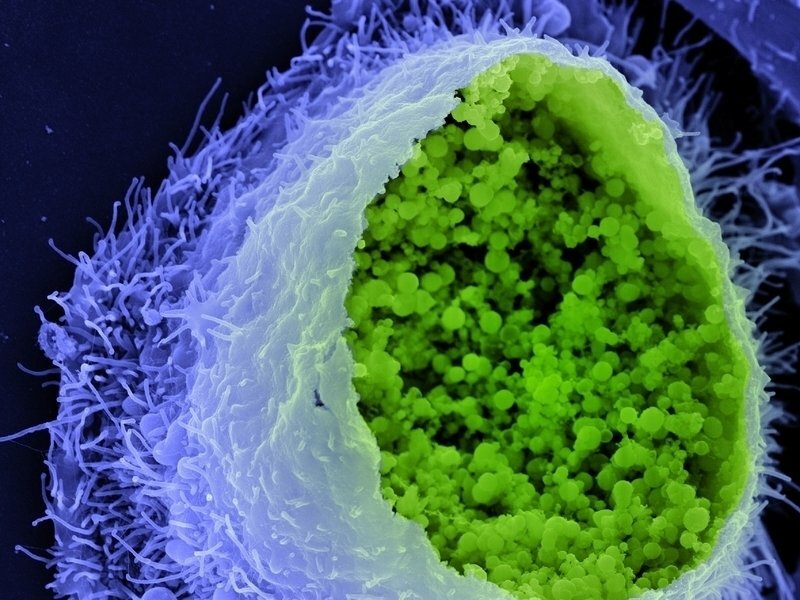 Activation of the suicide program would be fatal for Chlamydia, however, as the bacteria are only able to multiply inside their host cells from which they draw their nutrients. To protect themselves, Chlamydia therefore block activation of the cellular suicide program. With the help of colleagues from the Max Delbrück Center for Molecular Medicine and from Australia, the Max Planck team has now shown that Chlamydia ensure the survival of host cells by breaking down p53. They do so by activating a breakdown pathway that is already present in cells. The pathogens thereby gain enough time to successfully reproduce inside the cells. However, this has potentially fatal consequences for the host organism: destruction of p53, the central “guardian of the genome”, increases the risk of mutant cells surviving and developing into cancer cells. Degradation of p53 is also observed in infections with human papillomavirus, the cause of cervical cancer. Chlamydia may play a role in this disease as well. However, they penetrate much deeper into the genital tract and can cause inflammation of the fallopian tubes, where they often reside unnoticed for a long time. Ovarian cancer, one of the deadliest cancers in women, is now also believed to originate within the fallopian tubes. “The impact of Chlamydia on p53 is an important part in the complex puzzle of cancer development. The more substantiated the relationship between infection and cancer becomes, the more important it will be to promote the development of effective vaccines and antibiotics to prevent cancer,” says Thomas F. Meyer, Director at the Max Planck Institute in Berlin.